Clipper have been making magical teas in Dorset since 1984. 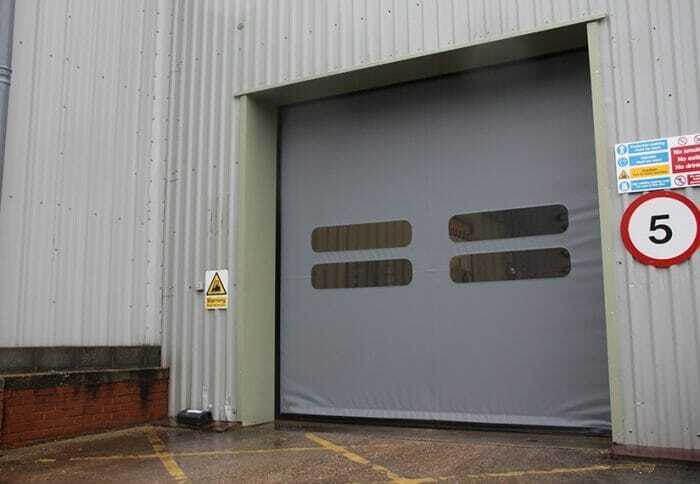 Their existing loading bay had a folding shutter installed which was left open all day and then the opening was shielded as best as possible by some PVC strip curtains.The doorway was busy with forklift traffic through it around 2 or 3 times an hour. The folding shutter was slow and difficult to operate and the strip curtains had become scratched and opaque as well as failing to provide a good seal against the ingress of the weather and contamination. The main issue was the existing doors didnt offer a good seal against ingress of the weather or contamination. The new door had to be suitable for high-use and preferably resistant to forklift damage. However it also needed to provide security and insulation outside of operating hours and to maintain and improve the building aesthetics preferably all fixing inside the building. It was also preferable to maintain the existing clear opening size rather than fix a door within the reveals. Armashield attended site to survey and discuss the requirements with the client. The proposed solution was the Rapidor Dupli door. This combines a self-repairing PVC speed door with an insulated roller shutter all in one frame. The door was provided with a remote control to make things easy for Clippers forklift drivers and also featured safety such as a soft bottom edge with reversing sensor, safety flashing beacon and a low level photocell. The speed door can be used during operating hours offering opening speeds up to 2.5 metres per second, and the roller shutter is put down out of hours to provide security and insulation. "Good communications. Polite, tidy and personable installation engineers. Good equipment. Generally a positive experience all round." Clippers warehouse staff have been pleased with how the door operates and the speed doors auto-close function means the door no longer gets left open to let the weather in. The fast action means less standing around and the doors zipper edges provide a good seal to reduce energy loss. The door also looks good and provides clear through vision for improved safety. A side effect has been that several members of Armashields staff have taken to drinking Tea and magical smells of exotic Clipper blends such as "Green Tea with Lemon" and "Organic White Tea" now drift around the office!